Is it snowing in Drahobrat ?Thank you! Issued: 2 pm 21 Apr 2019 (local time). The snow forecast for Drahobrat is: A light covering of new snow on Sun afternoon turning to drizzle on Wed morning. Freeze-thaw conditions (max 5°C on Wed morning, min -1°C on Mon morning). Winds increasing (calm on Sun night, fresh winds from the SE by Mon night). Drahobrat Weather (Next 3 days): The snow forecast for Drahobrat is: A light covering of new snow on Sun afternoon turning to drizzle on Wed morning. Freeze-thaw conditions (max 5°C on Wed morning, min -1°C on Mon morning). Winds increasing (calm on Sun night, fresh winds from the SE by Mon night). Drahobrat Weather (Days 4-6): Moderate rain (total 17.0mm), heaviest on Fri afternoon. Very mild (max 12°C on Fri afternoon, min 6°C on Wed afternoon). Wind will be generally light. Moderate rain (total 17.0mm), heaviest on Fri afternoon. Very mild (max 12°C on Fri afternoon, min 6°C on Wed afternoon). Wind will be generally light. A light covering of new snow on Sun afternoon turning to drizzle on Wed morning. Freeze-thaw conditions (max 5°C on Wed morning, min -1°C on Mon morning). Winds increasing (calm on Sun night, fresh winds from the SE by Mon night). The above table gives the weather forecast for Drahobrat at the specific elevation of 1703 m. Our sophisticated weather models allow us to provide snow forecasts for the top, middle and bottom ski stations of Drahobrat. To access the weather forecasts for the other elevations, use the tab navigation above the table. For a wider view of the weather, check out the Weather Map of Ukraine. 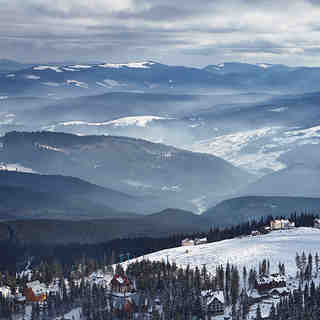 Really not far from Bukovel and worth trying at least one time if you are considering skiing in Ukraine or are skiing in Bukovel. The off-piste or backcountry skiing is fun and interesting although it's not very steep or long like in some Alp places. If you like some of that type of skiing it's worth to stay there for some days. We didn't try this but there's possibility to lift higher with prepared groomer to 1883m height, we considered that there's no powder but ice because of big winds and the length of the off-piste slope from there will be only about 2km. There are not many slopes in Dragobrat and they are not so good made and prepared like in Bukovel so some "only piste lovers" or beginners may get bored after more than one day there. 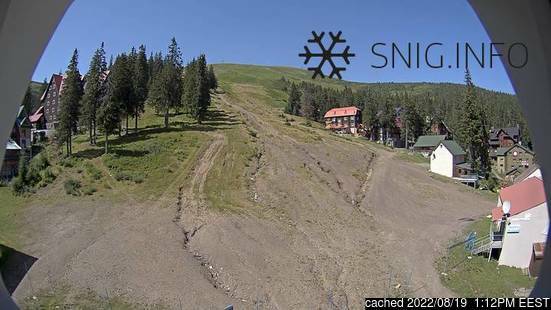 There are about three or four separate owners of ski lifts in Dragobrat so be prepared to buy different ski passes for each lift and that some ski lift may be closed if there are not many skiers. Would recommend to go there by 4x4 because road to the resort is very poor. There is possibility to leave your car in private parking where the road to resort starts and get a 4x4 taxi which will get you to the resort and back for about 100-200UAH for 4 persons lift as locals told but it is possible that the local 4x4 taxi drivers may invent much bigger prices and ask some money for parking from foreign skiers as it was in our case. We considered that the best way is to leave our car in Yasinya center and take a 4x4 from there because it's no difference in price and leaving our car there seemed safer. If you are going up by local 4x4 taxi there is possibility to leave all your belongings in some of ski rents up there in resort. Although we didn't try any accommodation it seemed that there are many guest houses, apartments and small hotels. The prices as we asked vary depending from the conditions starting from 150UAH for one room per night with two times eating. On mountain there is some cafes and mountain restaurants, the quality varies depending from prices but mostly they are about two times higher. It seemed that up in the resort except small hotels, houses and one sauna with 2x3m pool there's no other infrastructure. The staff of ski lifts and cafes seemed friendly and helpful but of course they will speak only Ukrainian and maybe little Russian if you will look wealthy. The Drahobrat skiing weather widget below is available to embed on external websites free of charge. It provides a daily summary of our Drahobrat snow forecast and current weather conditions. Simply go to the feed configuration page and follow the 3 simple steps to grab the custom html code snippet and paste it into your own site. You can choose the snow forecast elevation (summit, mid-mountain or bottom lift) and metric/imperial units for the snow forecast feed to suit your own website…. Click here to get the code.